On January 26th, 2019 Sony Europe updated their Decommissioned Servers page to announce that “multiplayer and all online features” for StarBlood Arena would be discontinued on July 25th, 2019. The announcement also pointed out that as the game required a connection to the game servers, the entire title would become unplayable on the same date. 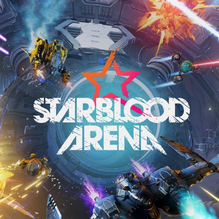 StarBlood Arena was then removed from sale on PlayStation 4 between January and March of 2019. PlayStation Plus subscribers who claimed it when it was added to the Instant Game Collection in 2018 could still find it in their Download List. The game remains available on physical media, though it too became unplayable after July 25th. As explained by Koottarappallil himself, the game was ultimately shut down due to lack of active players among the already-small PlayStation VR base. “Test your mettle in furious arena combat as you move, evade, and attack in any direction against pilots from every corner of the galaxy. Fight for glory, credits, and your life as the StarBlood Network broadcasts every lawless match for the universe to see. Whether it’s single player Carnage deathmatches, Team Carnage* deathmatches, or Invaders co-op*, you’ll be constantly challenged to step up your game and prove that you’ve got the skills to emerge victorious.